In the parlance of the economy system, a market is any entity (generally a planet or a space habitat) that participates in the economy. One of the primary ways of interacting with a market is through the trade screen, which therefore needed a major revamp from its current incarnation. Let’s take a quick look at the new trade screen, and then talk about the details of how markets work. Please note that the market-related screens aren’t completely finished. 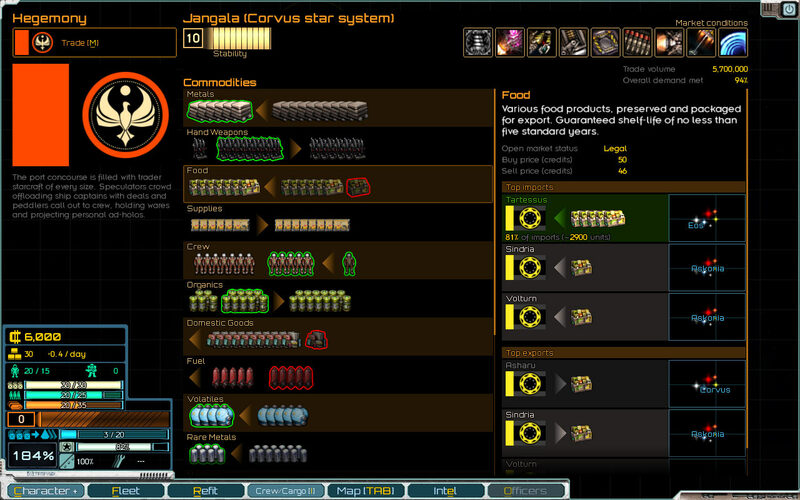 Some of the artwork in the screenshot uses placeholders – for example, the top-right icons for market conditions currently use hull mod icons. In general, things could change from what you’re seeing now, but I wouldn’t expect them to change too much. That said, let’s dive into the details! In the upper right, you can see a row of icons labelled “market conditions”. Market conditions are the building blocks that define a market – they determine what it produces, what it consumes, how much population it has, what type of planet it is, and so on. For now, buildings and installations are also rolled into market conditions, though later on they’ll probably receive more detailed treatment. To the left of the market conditions, there’s an indicator of the market’s stability. Stability is a highly abstracted evaluation of the overall situation on whatever planet/space habitat this market happens to be on. High stability means things are generally going well, the government is in firm control, crime is low, demand for various goods is met, etc. Low stability is the opposite – crime is rampant, shortages of vital commodities are commonplace, and the local government, such as it is, is unable to maintain control. In game terms, high stability gives a market the ability to pull in more than its share of available goods, meaning more of its demand is met. It also means that less is available on the black market. Low stability, on the other hand, means a thriving black market and less demand being met. The demand for certain commodities also depends on stability – luxury goods (increased by high stability) vs drugs and hand weapons (increased by low stability), for example. Other effects of stability are likely, too, as it’s a convenient high-level assessment of the market. For example, it would make sense for low stability to make certain harmful events more likely, and for high stability to result in larger or better-equipped local patrol fleets. These are how the “open market” vs “black market” distinction works in the game. You can choose which submarket to trade with, with different goods being available, depending on local supply/demand, stability, and other factors. Depending on what faction is in control, certain goods are illegal and can not be traded on the open market at all. Of note, trades on the open market are subject to a sizable tariff, while trades on the black market are not. On the other hand, a thriving black market is actively harmful to the stability of the market, and there are Other Consequences (largely TBD at this point). This system offers a flexible base to build on as needed. Some of the things that we’ve discussed internally (but not decided on quite yet) are, for example, being able to trade with the military of a faction, gaining access to better hardware if you’re in good standing, or trading with an underground faction to undermine the rule of the faction currently in control. Supply and demand have come up a lot in this post, and it’s something the player needs to be able to see. This is challenging – I don’t think anyone wants to see a spreadsheet, but at the same time, there’s a lot of data to display. As we talked about in a previous post, the player doesn’t need to see this to find profitable trade routes (except for, possibly, smuggling and trade in exotic goods), which does make this job easier. Still, they need to be able to get a good idea of what’s being produced and shipped where, if they’re going to be able to affect the economy in a meaningful way. You can’t shut down the fuel shipments from Sindria and bring a planet to its knees if you don’t know it gets all of its fuel from Sindria, now can you? Hopefully, these are intuitive enough. In case they’re not, there’s a handy mouseover tooltip for each group of icons that says exactly what it is. Clicking on a commodity brings up detailed information. The specific contents of this screen are up in the air; the current incarnation shows the top markets this commodity is being imported from and exported to. 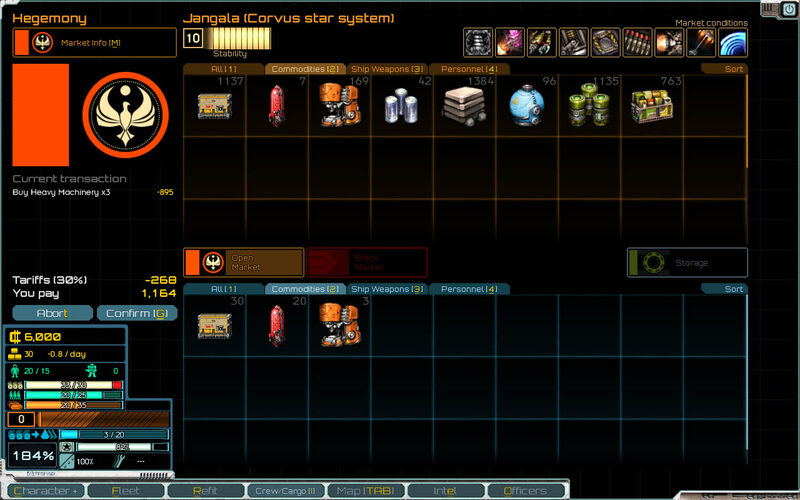 What ultimately ends up here will be driven by what tasks the player most wants to accomplish when they’re looking at this screen – the information needed to plot a hypothetical trade run is different from that needed to figure out how to cut off the aforementioned fuel shipments. What these tasks are, in turn, depends on exactly how some other stuff shapes up. Speaking of that, back to coding! This entry was posted on Friday, June 6th, 2014 at 8:10 pm	and is filed under Development. You can follow any responses to this entry through the RSS 2.0 feed. Both comments and pings are currently closed.